Before diving into exactly how to get a Google Ad Exchange (AdX) account, let’s get into the most common reasons why you many want one in the first place. One major reason is that there are lots of ad networks that compete against each other for a publisher’s ad inventory. That means that there is increased competition, which in turns means getting a better price for each ad. Sounds great, right? Ad mediation is a good thing for publishers. There’s only one issue — Google doesn’t approve just anyone to join the Google Ad Exchange. In fact, they are pretty selective! So, what can you do to get into the Google AdX? If you own a large site and already have a Google account manager then you’re well on your way to getting a Google Ad Exchange account already. Google typically doesn’t extend AdX invitations to just anyone, and an account manager can help determine if you’re ready to apply. A Google account manager can also help get you setup with other Google products that may benefit you, namely DFP (Doubleclick for publishers). Learning the ins and outs of Google AdX can be time-consuming, but is definitely worth it – many publishers see a substantial revenue lift by using AdX. 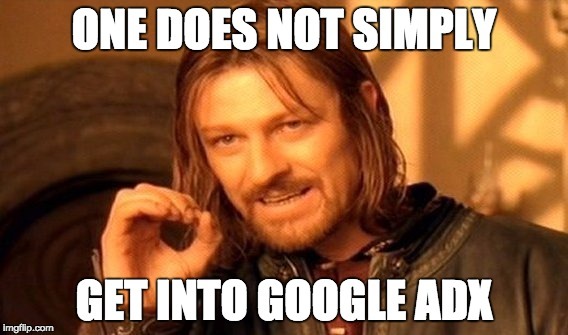 What if you don’t have a Google account manager? If you don’t have an appointed account manager, and you aren’t able to apply on your own, then don’t worry. There is another option. Google has a number of partners in their Certified Publishing Partner Program that are part of Google’s Network Partner Management (NPM) program. The program allows smaller publishers to sell their ad inventory through a larger publisher or partner. While it’s not exactly the same as having a standalone Google AdX account, a subsidiary account is a very close second. Publishers still get the benefit of AdX without having to meet all of the Google requirements involved in having a full account. Working with one of these partners makes sense beyond the benefits of setting up access to AdX. Ezoic, for example, has helped keep many publishers within Google policy to minimize the risk of violations (something that many combat). Tools like the objectionable content filter and ad tester safeguard your site from showing ads on pages with profanity and ensure your ad density doesn’t hinder user experience. And, now that Google no longer limits publishers to three ads per page, the burden to stay within policy has shifted even more onto publishers. You might be wondering why it is so hard to get into Google Ad Exchange. There are probably a number of reasons that the average user isn’t privy to, but a major reason is the quality of the ads coming from AdX. AdX runs on a CPM basis, which means advertisers pay for the impression (presumably a view) and not just for clicks. It’s sort of like a billboard. If you could buy a billboard on a clean, well-maintained street or one with potholes and overgrown weeds, which would you choose? When ad buyers bid on space provided by the ad exchange they are expecting well maintained, and excellent sites. Those excellent sites will bring quality users who are more likely to respond to their advertisements. By keeping the standard high for Google AdX, it can attract better advertisers who will end up bidding higher prices for publisher ad inventory. They’ve created an ecosystem that delivers a win-win situation for everyone. If you already have a Google account manager there’s a good chance you can get set up with a Google AdX account through them. If you don’t, the process can be kind of restrictive. The best method for getting into the Google Ad Exchange in this case is getting set up with a Google Certified Partner. There are a lot of benefits of going this route; including the ability to minimize risks associated with having accounts shuts down due to unintentional violations. Apply to get into Ad Exchange today…. Have more questions about getting a Google AdX account? Ask one of our team members today. We help get people into ad exchanges every day.